Whether you are free weight enthusiast or love your plate loaded machines, these plates will be perfect for most of your daily gym activities. 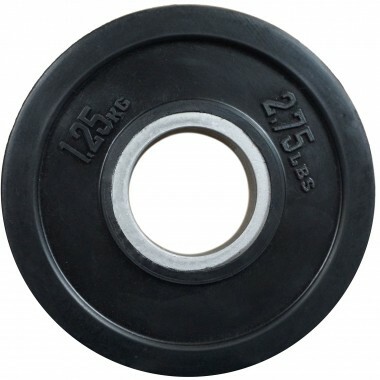 Olympic weight plates have an internal diameter of 51mm. Making them suitable for most modern barbells and plate loaded machines. Increase your lift weight in small increments, reach a new PB faster and break through your plateaus while weight training with 0.5kg Fractional Olympic Plates. There are quite a few ways to increase resistance in your training. You can either aim for a higher repetition range or chuck a few extra plates on the bar. Cast Iron plates are quite slim, so you don’t have to worry about maxing out the whole sleeve or weight horn space. Weight plates don’t go out of date. Once you own them they will last you forever. Even though it might seem like a lot of money to spend just on weight, these plates will be with you throughout your weight training journey. 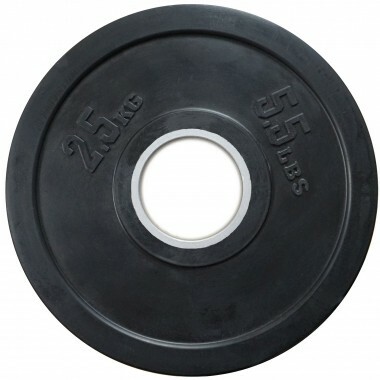 Besides, our basic Olympic weight plates offer such great value. They have been the same price for years and we have sold truckloads. These plates are made from high-quality cast iron and encased in low odour, durable rubber. The rubber casing protects the weight from rusting, reduces noise and surface scratches. The tri-handle design makes the plates comfortable to use. You can easily carry two plates at a time without fear of them slipping out of your hands. They have three grip positions, so loading barbells and plate loaded machines takes less time. Save your time and energy for training, not weight loading! The inner part of the handle is grooved, giving you a better grip. Try gripping a steel plate with sweaty hands after a heavy set. The edges of the plate are also rounded, which makes them a lot safer when in use around the gym floor. Some cast iron plates have straight edges. Bumping into them can be quite painful to your shins! But the best advantage of these grips is that they turn your weight plate into a piece of exercise equipment. Weight plate exercises – where you grip the plate and perform specified movements – are simple yet highly effective. The shape alone of the weight plate makes certain exercises like oblique twists different to performing them with dumbbell or kettlebell. Having the grips and the rounded rubber edges gives you quality gripping options. Do yourself a favour. Research some exercises that you can perform with weight plates and give them a try. You will be pleasantly surprised, albeit a little sore and sorry the next day as they can hit spots that you never knew you had. Our Olympic plates have weight markings that will never wear off! The plates feature elevated weight numbering in both pounds and kilos. These plates also come with stainless steel inner rings, this protects the sleeves on your barbell or machine from being scratched. 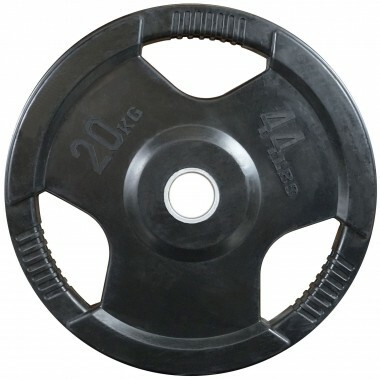 Our base plate is a common design and is therefore seen in many gyms. For those of you who want to have a smarter looking plate we have the Power Maxx Premium Plates. They offer a different design with some cool features and they are very affordable. Interlocking design prevents the plates from rotating. This reduces the torque produced by any explosive lift, making the lift feel smoother. As these plates are thicker, this design feature enables you to fit more plates on your barbell. The Premium Plates come with an encased Power Maxx Logo and two weight numberings: one encased and one elevated. This makes identifying the weight easier. Plus, for those who are looking to make their gym a showpiece, a point of difference to the run of the mill Olympic plates. These plates are also covered in high quality, low odour rubber. Making them perfect for anyone who wants to set up a gym in their spare room.